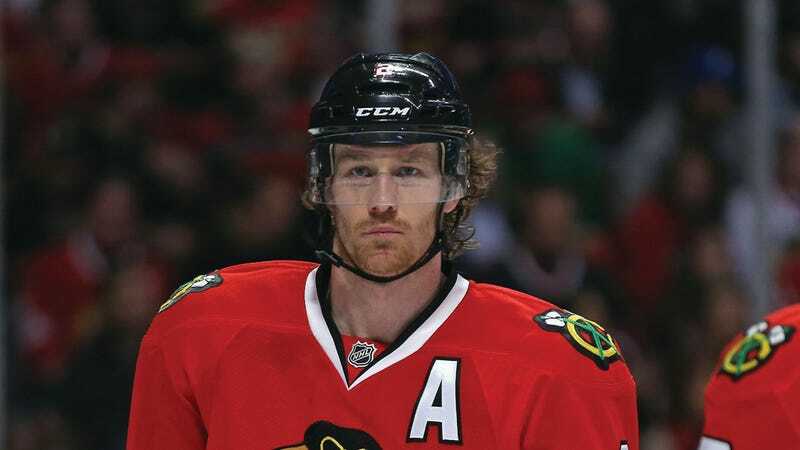 Following a perfectly executed goal by Vancouver Canuck Daniel Sedin during last night's Chicago Blackhawks vs. Vancouver game, Blackhawks hockey player Duncan Keith used his hockey stick to deliver a chop to Sedin's back. Sedin wasn't injured, no penalty was called and the Canucks still went on to win the game. You'd think that freebie would be an end to Keith's unsportsmanlike behavior, but no. It was brought back up again when Karen Thompson, a reporter from Team 1040 in Vancouver asked him about it in the postgame media scrum and Keith responded with mildly sexist condescension. Thompson: Can you talk about what happened after the Daniel Sedin goal? Keith: Which one was that one? Thompson: No, right after the goal. Right after he scored. Keith: He scored. I went off the ice and took a minus. I don't know, what are you talking about? Keith: What did you see? Thompson: Well, it looked like there was maybe a penalty that went undetected. You seemed a bit frustrated. Keith: Oh no, I don't think there was anything. I think he scored a nice goal and that's what the refs are for. We should get you as a ref maybe, hey? Thompson: Yeah, maybe. I can't skate, though. Keith: First female referee. You probably can't play either, right? Keith: But you're thinking the game like you know it? 'k, see ya!